Is an evil nun. Can’t imagine it’s a spoiler to mention that. This cold open, aside from not making a ton of sense given the demon nun Valak’s end goal, establishes the foggy, gloomy atmosphere of the film. One of the nuns, as she runs from Valak, commits suicide by hanging. Her body is discovered by a courier who goes by Frenchie (Jonas Bloquet) (he’s really French-Canadian), and the Vatican is quickly notified. Assigned to the case is Father Anthony Burke (Demian Bichir), who is accompanied by Frenchie and a novitiate named Irene (Taissa Farmiga) to ascertain whether the convent is no longer a holy place. The Nun, while providing some enchanting and inspired imagery, suffers from uninspired and largely illogical storytelling. Sure, some of the set pieces cause one to tense up (although the jump scares are tepid all around). But the malaise of exposition that hampers the scenes in-between borders on the insufferable. Each line of dialogue sets up a device used later on to move the story or elicit a scare. The characters, as a result, are plot devices in and of themselves. There is no sympathy for Father Burke and his harrowing past as an exorcism priest, because that is introduced merely to conjure up images later in the film. It is hard to imagine oneself in the shoes of Sister Irene, because her sole purpose is to confuse the audience with “visions” of eerie things that aren’t truly there. The characters are as empty and vacant as the dead eyes of Valak, an antagonist that for the majority of the film appears more silly than shiver-inducing. With no conduit in which the viewer can place themselves within the terrifying situation, the incessant frights just ring hollow. Moreover, that the excessive exposition does not even fix the problems in the plotting makes for a frustrating experience when the denouement attempts to bring certain threads full circle. It is a denouement, I must add, that does not leave one with chills as the script intends it to, because events that we have already witnessed in the timeline of the The Conjuring universe nullify any danger that this knowledge might be inferring. Beyond that, the plot requires of the viewer an amount of suspension of disbelief that is inexcusable. The lack of rules within the Conjuring films has always been a problem to one degree or another. But with a film like Conjuring 2, the lack of rules does not take away from the delightful scares that come from James Wan’s set pieces. With The Nun, it feels as if director Corin Hardy assumes the same rules apply. But the slippery, inconstant nature of the supernatural specter allows for anything to happen, meaning that whatever will happen won’t feel earned. This is not to disparage Hardy from a visual standpoint. The use of camera movement makes for small stings of suspense within given scenes, even when the suspense isn’t building to a loud scare. And one sequence involving a looming shadow inside a church is composed with a precision that maximizes the visual energy and suspense, even when this only leads to a dumb, loud scare. The Nun is no Truth or Dare, where incompetence and laziness ooze from the seams of every edit. There is craft at work, and Farmiga is no slouch on the acting front in spite of her weak character. The music cue to signal Valak’s looming presence is also quite foreboding and ominous, even if it is not utilized in a particularly effective manner. But it is also not a fun experience. It is dreary and without energy, even if it tries to fool the audience with some half-baked jokes at the start of the final act. The scares are tedious and frequent, while tension is in short supply. 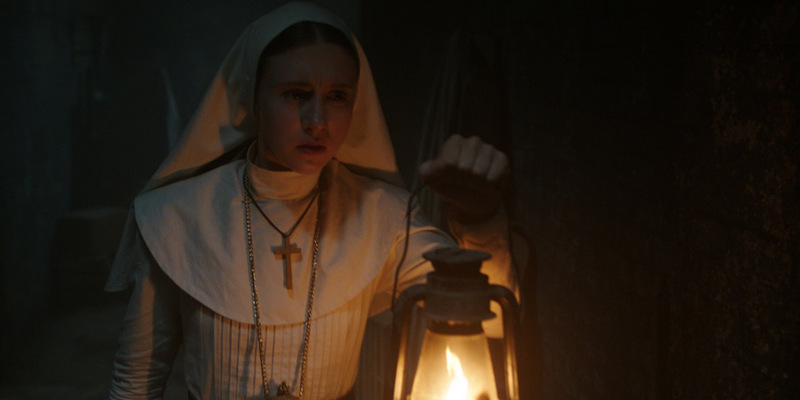 The Nun is the Annabelle: Creation of nun-based Conjuring spinoffs: not entirely unwatchable, but entirely unremarkable.